Enter Connie's imaginative world in the first of many adventures with this beautifully written and illustrated childrens book. 205 backers pledged £7,150 to help bring this project to life. If we manage to get the total to £7,500 before the campaign ends then the book will get an upgrade! The printed hardback cover will be replaced with a cloth cover and NEW embossed illustration and book title. The glorious front cover "family photo" will still take pride of place on the dust jacket that encloses the book. We believe this is a luxurious upgrade to Connie's first book. 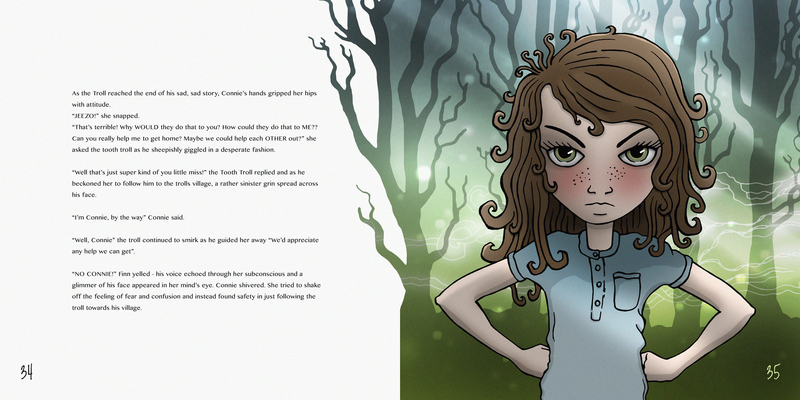 We want to share the fantastic world of Connie through our [first] book Connie and the Tooth Troll. With your help and pledges we can bring this world alive and delivery a beautifully written and majestically illustrated book straight into your hands! With your support comes an exclusive first glimpse into this world. One that we hope will grow into further stories that we can share with you! What is the book Connie and the Tooth Troll about? Connie has a wobbly tooth. She can either pull it out and get some money from the tooth fairy, or go to bed with it still dangling there - leaving her vulnerable to a visit from the Tooth Troll! Half asleep and in a panic, she accidentally falls into a portal which transports her to a strange, faraway realm. She finds herself lost, lonely and afraid in a land inhabited by trolls and fairies. Will anybody help her to get back to the warmth of her bed or will she be stuck there forever? Can she trust anyone? And if so.... who?? Connie and the Tooth Troll explores a range of human emotions and touches on some darkness with the light of positivity always shining through. It is a visual treat with full-page illustrations using a dreamy palette of colours and a look that creates a haunting yet endearing world. So what does the book look like? A hardback in full colour with 60 pages filled with gorgeous illustrations! Printed offset, and with a generous size of 25cm square the illustrations and text will look great printed on 150g silk paper. A treat for the eyes! It was a stormy evening in late Autumn. And what about the other items contained within pledges? Basically Kickstarter is a way for creative people to fund their projects. In this case we have a book we would like to share. This requires funding in order to print and deliver to those interested in backing us. The funding goal that we have is the amount of money that we need to complete our project. Funding on Kickstarter is all-or-nothing. No one will be charged for a pledge towards this project unless we reach our funding goal. This way, we will have the budget required to be able to fulfil our project. A backer, (that's you!) are folks who pledge money to help bring our project to life. Read what Kickstarter says here. How do you make a pledge? It's pretty simple really. Take a look at the list of pledges on this page. Select the pledge you want. Enter your payment details. Your payment method will not be charged at this time. If the project is successfully funded, you will be charged according to the pledge amount you choose when the project ends. And remember: The more you pledge, the more likely we will reach our goal and be able to send your reward. What are my funds actually funding? Our ambition is to be able to make a run of at least 300 copies of Connie and the Tooth Troll printed with offset lithography. This will result in a beautifully printed and professional book. If the pledge you have selected includes a book then you will be able to experience this. We have accounted for 50 of these copies to stay with us for promotional reasons and will use these to get interest in the Connie World from book publishers. Postage and delivery. All overseas pledges (outside UK) will be marked as "mechandise" and we are not ourselves accountable for any duty fees that may be incurred. Please feel free to leave comments in the comments section here or leave a question in the FAQ section here. You are welcome to email us at yourfriends@conniebooks.com or leave a message on Facebook and Instagram! Please share Connie and the Tooth Troll and help us reach our goal. The 2 pieces of music used in our Kickstarter film are Mussorgsky: Pictures At An Exhibition - Gnomus and is copyright free and Wasted Britain under licence of Scott Holmes. 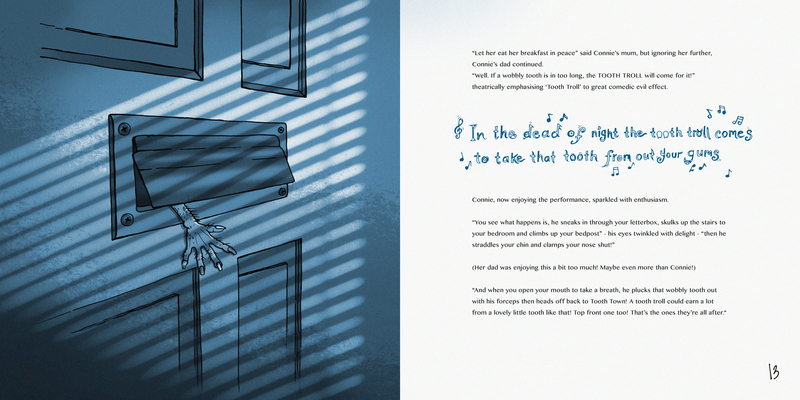 The book Connie and the Tooth Troll is written in full and almost all illustrations are complete. At current we are working with the final touches and small edits. All costs are calculated and we have a turnaround time for the printer. So we are very confident on finishing the project and being able to distribute rewards within the timescale above. One of the issues we have grappled with is the postage and packaging costs and we decided to include the international shipping rate within all book pledges. This bumps up the pledge amount a little but it also gives us peace of mind if the majority of our backers are overseas, plus it allowed us to define out target amount easier. For our overseas backer (outside of UK) please be aware that the delivery time varies depending on country. E.g US delivery aim 41 days, Sweden delivery aim 15 days, Australia delivery aim 84 days. Backers within the UK will receive their pledge with a delivery aim of 3 days. We salute you! Take a virtual high five through the screen! 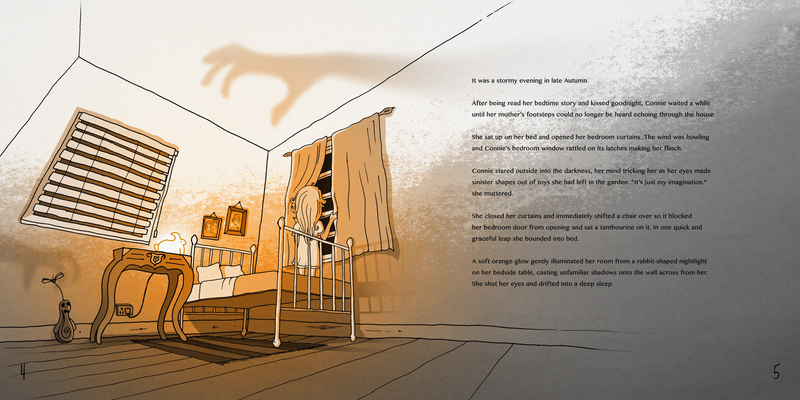 A hi-res PDF version of Connie and the Tooth Troll will be winged down a hieroport straight to your device! God speed! PLUS all our plucky PDF pledger's names' will be entered into a draw for one lucky winner to receive a signed copy of the Connie and the Tooth Troll hardback book!! Take a book at this! An actual book! Your kindness is rewarded with an actual physical hardback copy of the Connie And The Tooth Troll book ♥ beautifully packaged in Troll Blue paper with sticker! A hardback copy of Connie And The Tooth Troll. A Connie and the Tooth Troll bookmark. An exclusive Connie and the Tooth Troll postcard. A limited edition Connie or Finn bracelet. An actual book (well 2 actually)! Your kindness is rewarded with 2 actual physical hardback copies of the Connie And The Tooth Troll book ♥ beautifully packaged in Troll Blue paper with sticker! FANTASTOOTH! You're a top pledger! Limited edition Connie or Finn bracelet. Limited edition prints (3 of 3 designs). ...BOTH SIGNED by the creators!! YOUR very OWN hidden message* within the book written in Tooth Town script and decipherable with the Tooth Town Alphabet Decipher Sheet (TTADS).